Jessica Nae- Smith, Living healthy in the modern world, one step at a time. Whether you eat healthily or exercise on a regular basis, there’s something to be said for the connection between the mind and the body. It can be hard to get out for a hike or eat broccoli every day, but when it comes to what you consume your body can actually reap the rewards of choosing health and embracing the benefits of good nutrition! Fortunately, while food can certainly provide you with an abundance of energy or make you feel sluggish on the flip side, studies have shown that it can instantly improve your mood. 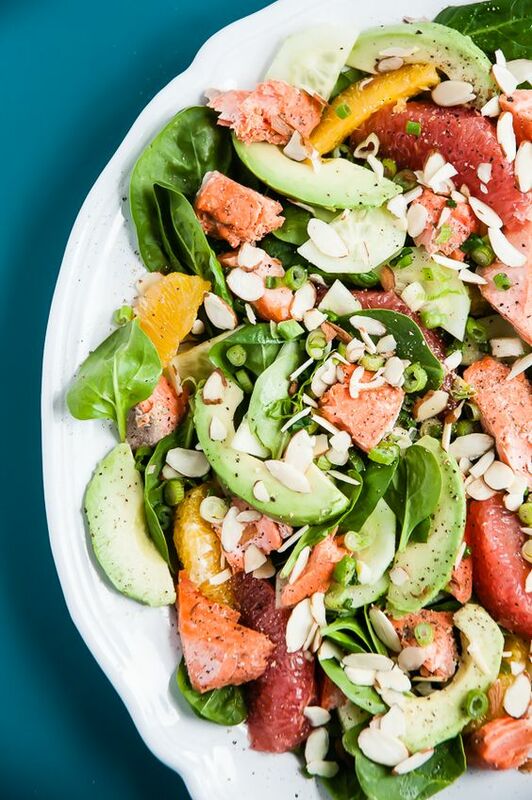 It might seem like reaching for the beer or a piece of cake might be an instant mood booster, but here are a few healthy foods you might want to try instead that can truly boost your mental well being. There is few foods that can make every “Best of…” list when it comes to their health benefits and general nutritional value. Fortunately, for those who like fish, salmon is one of the best sources for omega-3 fatty acids rich in EPA and DHA. While omega-3s have many health benefits, it is believed that they can contribute to healthy brain function, and thereby improve the sense of well being in the body. Given the ease of simply being able to peel one, bananas can be one of the best fruits out there when it comes to getting your daily intake. Fortunately, bananas are also chock full of tryptophan, which can work to regulate the way you feel. In addition, bananas also contain folate, which can help one in steering clear of low moods and depression. So, the next time you feel a little down in the morning, there’s no easier solution than throwing a banana in your bag. Most people are aware of the antioxidant potential of berries, but according to research by the Torrey Pines Institute for Molecular Studies, some berries have a similarity to valproic acid which is proven to regulate the mood. And, while this might seem ideal for those who are looking for an energy boost, the antioxidant potential of berries also works to reduce inflammation which can help stave off the bad vibes. Whether you add them to oatmeal or into honey ice tea, there’s plenty of ways to get in this colorful fruit. Beans may be a great source of protein, but they also happen to be a vegetable that has considerable benefits when it comes to balancing your body. According to a study by the Department of Agriculture in the United States, low magnesium is actually linked to lower energy levels so foods that can boost your magnesium levels will provide higher energy. Whether you go for garbanzo or you stick to black beans, there are plenty of protein-rich, magnesium-laden options. For many people, eggs are an ideal protein source that can be consumed in a variety of forms, from scrambled to fried to hard-boiled on top of salad. Fortunately, because they’re high in protein, they can also regulate blood sugar and assist in maintaining a good mood. If that weren’t enough, they’re also full of many essential amino acids likes’ omega-3 fatty acids, vitamins A and D, and zinc, which assist in managing anxiety. In whatever form, the health potential of eggs is pretty great! A glass of green tea may be good for a simple sip, but this potent liquid has really made its mark in recent years for its many health benefits. While most people are aware of the antioxidant potential of green tea, other benefits abound in the substance. According to a study from the University of San Francisco, the polyphenols present in green tea can boost the availability of dopamine, which is important in enabling a positive mood. Like alcohol, chocolate may be one of the common go-to foods when it comes to indulging, but when paired with either red or white wine, the benefits of dark chocolate increases manifold. Fortunately, when it comes to chocolate, the dark version has many benefits that go beyond satisfying sugar cravings. While dark chocolate has proven antioxidant potential, it’s also been proven to reduce the amount of the stress hormone cortisol in the system. While milk chocolate can be a mood destabilizer, the dark stuff is ideal when it comes to bumping up your mood. There are few foods available out there that are better for you than spinach, but there’s a lot more to this leafy green than meets the eye. As it stands, spinach may be great when it comes to getting in your daily vegetables and bumping up your iron, but it’s also a great source for folic acid, which helps to minimize depression and fatigue. Whether you add it to a wrap or a salad, this can be an instant, easy mood booster! Jessica, a registered dietitian, a wellness guru that loves to read, research and write. A fitness freak who believes in healthy living and doesn’t like to miss her yoga. When not reading she can be found relishing her favorite foods transforming leftovers into makeovers.